Here, Here or Hear, Hear? If you want to voice your agreement with someone during a debate (especially if you’re a member of the UK Parliament), you will shout “hear, hear.” But as long as you’re shouting, no one will notice you’re wrong if you shout “here, here” because the words are pronounced the same. The United Kingdom has a long and proud history of parliamentarism. The current incarnation of the country’s Parliament, the Parliament of the United Kingdom, has a history that can be traced through its predecessors, the Parliament of Great Britain and the Parliament of England, all the way to the early thirteenth century. As is often the case with places and institutions that have a long tradition, we can find relics of the past that persist in modern times. For instance, MPs are still offered snuff before they enter the Chamber. There is still some use of Norman French in the legislative process. And MPs still shout “hear, hear” when they agree with something one of them has said. 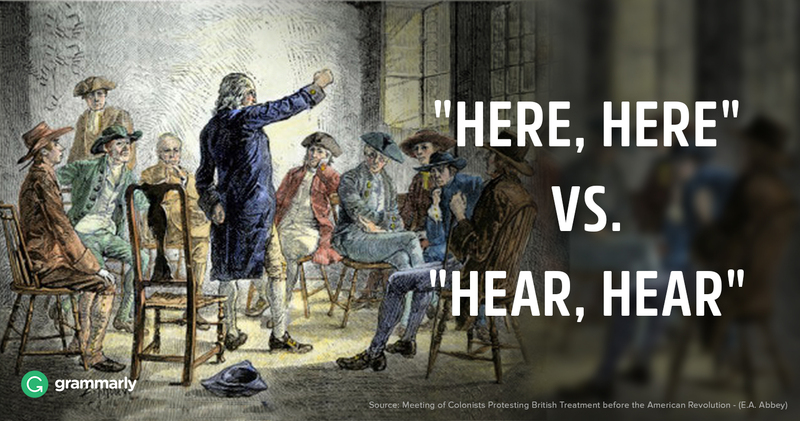 The phrase hear, hear seems to have come into existence as an abbreviation of the phrase hear him, hear him, which was well-established in Parliament in the late seventeenth century. The UK Parliament prides itself on its lively debates, and saying “hear him, hear him” was a way to draw attention to what a person was saying. And in case you were wondering, there was no “hear her, hear her” variation—the first female MP was elected in the twentieth century. Sometime during the eighteenth century hear him, hear him acquired its short form, hear, hear, and that form is still used today. When you say hear, hear, you are in fact saying that you agree with something another person has just said. So you can replace hear, hear with phrases such as “I agree wholeheartedly,” “what he/she said,” or “yeah,” depending on the formality of the setting and the speakers. Hear, hear can also be used as a cheer; that’s why you sometimes hear it at the end of toasts. Why Is It Easy to Confuse? Hear, hear is often confused with here, here. The obvious reason is that the verb “hear” and the adverb “here” are pronounced the same. That means they are homophones, and as we’ve mentioned once or twice, homophones are easy to confuse. They can be especially confusing in a phrase like hear, hear, which is spoken aloud but rarely written down. However, as confused phrases go, here, here has taken root and is very commonly seen.